"Get ready to lock up your doors for a third time"
The success of this summer's The Purge: Anarchy (the movie grossed $108.7 million worldwide against a $9 million budget), which is a sequel to the 2013 commercial hit The Purge (grossed $89.3 million worldwide against a $3 million budget), has put writer/director James DeMonaco on the map for taking a fresh concept to the horror genre and finding success. According to Deadline, Universal Pictures, along with production companies Blumhouse and Platinum Dunes, have decided to start development on a third installment in the fright series. The news comes as no surprise, since the previous two movies had a combined budget of $12 million and a combined gross of nearly $200 million worldwide. DeMonaco will once again write the third, with an eye to direct his story line about a society where one night of the year, murder is legal and if you aren't locked up at home, you are vulnerable to the mayhem. DeMonaco told Deadline that "I never imagined that The Purge would become the phenomenon it has become and I am thrilled to continue my collaboration with Blumhouse, Sebastien Lemercier, Platinum Dunes and the great team at Universal in building The Purge into a worldwide franchise.” Returning as producers will be Sebastian Lemercier, Blumhouse Productions’ Jason Blum, and Platinum Dunes partners Michael Bay, Brad Fuller and Andrew Form. The franchise is part of the wide ranging deal between fright factory Blumhouse and Universal, which was just extended a decade. 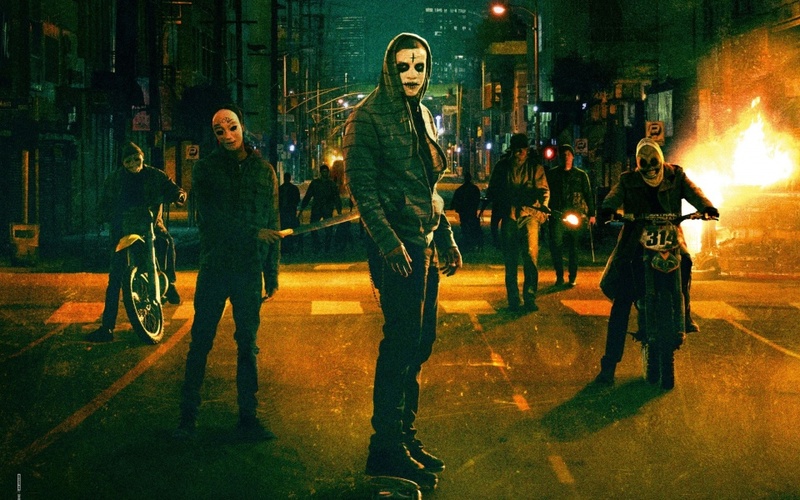 I look forward to another installment, especially since The Purge: Anarchy took what was touched upon in the first movie and opened up the world, into the streets, to create a sequel that topped the original in thrilling and thought-provoking ways. It's a unique concept that I hope DeMonaco mines for the many interesting avenues it can lead towards. No word yet on a release date, but probably look for this to be on the fast track to go into production soon and land on the late 2015 schedule in theaters.